You will probably be thinking about canning squash if you are growing squash. 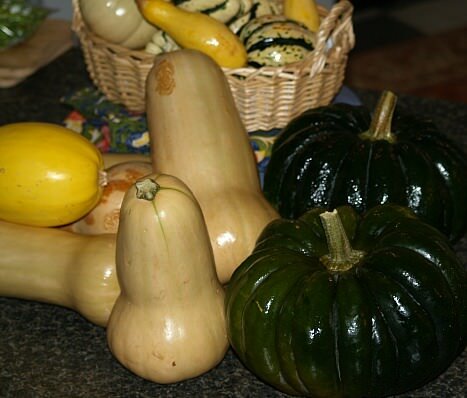 All squash are gourds; fleshy vegetables with seeds on the inside and protective rinds on the outside. It doesn’t take many of these plants to become overwhelmed with squash. There have been years when I could not find enough recipes for all the pumpkins and zucchinis which I had and I don’t like to see anything go to waste. Most squash can be used in entrée casseroles, side dishes, sweet breads, cakes and cookies to make delicious recipes. If you will be canning squash, you should learn something about the large number of squash varieties. These are broken down into two basic categories; the summer squash varieties and the winter squash varieties. The summer squash varieties like zucchini, yellow crooknecks and the pretty scalloped type called pattypan squash have tender and edible rinds and seeds because they are harvested while still immature. The winter squash varieties like acorn, butternut, buttercup, Hubbard, spaghetti and pumpkin have tough seeds and rinds. NOTE: I do not can any plain squash but I do freeze some to use in soups and casserole dishes. Squash does make some good jam and pickles. Instead of canning squash, many people choose to freeze it; quite often cooks will make products like the sweet breads and then freeze them. This makes it convenient for a “quick grab”; the problem I have is that they are too convenient and they seem to disappear quickly. To some freezing is also done because they feel it is easier. Low acid foods such as squash, beets and corn must be processed in a pressure canner to assure that all the spoilage microorganisms are destroyed making it safe to eat. This is unlike tomatoes which are high acid and are cold packed or cucumber when making pickles or relish. Winter squash varieties must be canned by the hot pack method; wash the squash (or pumpkins), remove the seeds and peel. Cut into 1 inch cubes or slice and put in a large heavy saucepan. Steam until tender about 25 minutes then pack into hot sterilized jars; cover squash with hot liquid from cooking or add boiling hot water to ½ inch from top. Process in pressure canner with 10 pounds pressure for 55 minutes for pint jars and 90 minutes for quart jars. Some people like to have squash or pumpkin puree ready to use; since the heat penetration is not good it is recommended to freeze any type of puree. Summer squash is not especially good when canned or frozen; these are some that I mentioned are good to make products from and then freeze. For instance zucchini is not good when preserved but zucchini bread is excellent before and after frozen. Many of these do make delicious pickles and relishes and those do can very well. If you do decide to can any of these, like the winter squash, it is necessary to process them in a pressure canner because of the low acid. Unlike the winter squash, these can be canned by the hot pack method or raw pack. When canning squash, the summer squash varieties including zucchini, do not peel unless the squash is large and the skin is tough. Wash and cut into ½ inch slices; cut slices in halves or quarters depending on how large they are. For cold packing canning squash, pack tightly in hot sterilized jars and cover with boiling water up to 1 inch from top. For hot packing, after slicing, cover with boiling water and bring to a boil. Drain squash reserving the liquid; pack loosely in hot sterilized jars and cover with reserved hot liquid leaving ½ inch from top of jar. Cap and seal. Process packed jars at 10 pounds of pressure 30 minutes for pints and 40 minutes for quarts. This is a favorite of people who like canning squash. In a large bowl, sprinkle zucchini with brown sugar and let set for 1 day. Drain liquid from zucchini and put liquid in a large pan. Add 3 cups granulated sugar to each 2 ½ cups liquid. Add ginger, lemon peel and candied peel; boil fast for 10 minutes. Add zucchini cubes and cook slowly for 3 hours. 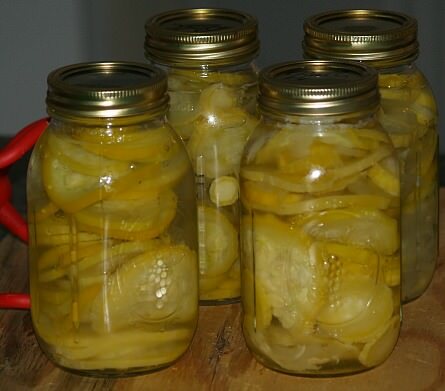 Remove lemon peel and ginger; fill hot sterilized pint jars leaving ½ inch headspace and seal. Process in boiling hot water bath for 15 minutes. Wash zucchini and cut in thin strips; cut onions in quarters and slice very thin in with zucchini. Cover with 1 inch water and add salt; let stand 2 hours. Combine white sugar, celery salt, turmeric, mustard seed and vinegar; bring to a boil for 5 minutes. Pour over zucchini and onions; let stand 2 hours. Bring all ingredients to a boil for 5 minutes; pack in hot sterilized jars leaving ¼ inch headspace. Adjust caps and process in boiling water bath for 15 minutes. Combine all ingredients EXCEPT tomato paste; bring to a boil and cook 30 minutes. Add tomato paste and cook another 15 minutes; pack hot in hot sterilized jars and seal immediately. This is always a family favorite when canning squash. Cream shortening and sugar; beat in eggs, pumpkin and liquid. Sift together dry ingredients and add to pumpkin mixture. Stir in nuts; pour into well greased wide mouth pint jars to ½ full. Bake in preheated oven at 325F degrees for 45 minutes. Remove one jar at a time from the oven; clean around the jar rim and seal tightly with lid. When canning squash or freezing, gather in good recipes to use your products in like this delicious squash fritters recipe. Combine squash (if frozen precook), eggs, crumbs, salt, pepper and onion; blend well. Pour 2 inches deep of oil and heat; drop heaping tablespoons full of batter into hot oil. Fry until lightly browned turning once; drain on paper towels. Canning squash is great for many yummy recipes throughout the year. Mash squash; add sour cream, soup, carrot, onion, salt and pepper. Mix melted butter with stuffing, line bottom of casserole dish with half of crumbs. Then spread layer of squash mixture, then remaining crumb mixture. Bake in preheated oven at 350F degrees for 45 minutes. Canning squash is easy when it is pickled. Slice squash, peppers and onion thinly; mix salt with water and pour over vegetables. Let vegetable mixture stand for 1 hour; drain. Combine and mix sugar, vinegar, turmeric and mustard seed; boil until syrupy. Add vegetables to the boiled mixture; bring back to boil. Remove from heat and spoon into hot sterilized jars; seal tightly with hot lids. Bring zucchini to a boil and cook about 6-8 minutes; add pineapple and lemon juice. Boil 6 minutes longer; stir in Jell-o. Spoon into hot sterilized jars and seal; process in boiling water bath for 15 minutes. Canning squash includes many pickles made with various types of squash. Combine vinegar, honey, celery seeds, turmeric, dry mustard and mustard seeds in a stainless steel saucepan. Bring mixture to a boil and pour over the vegetables; let stand 1 hour. Return total mixture to a boil and cook 3 minutes; pour into hot sterilized jars. Cover tightly, cool and REFRIGERATE.